Union army officer Cameron Scott is used to being obeyed, but nothing about this journey to Lake Tahoe has gone as expected. He's come to fetch his daughter and nephew, and seek revenge on the people who killed his brother. Instead he finds himself trapped by a blizzard with two children who are terrified of him and stubborn but beautiful Gwen Harkness, who he worries may Union army officer Cameron Scott is used to being obeyed, but nothing about this journey to Lake Tahoe has gone as expected. He's come to fetch his daughter and nephew, and seek revenge on the people who killed his brother. Instead he finds himself trapped by a blizzard with two children who are terrified of him and stubborn but beautiful Gwen Harkness, who he worries may be trying to keep the children. When danger descends on the cabin where they're huddled, Cam is hurt trying to protect everyone and now finds Gwen caring for him too. He soon realizes why the kids love her so much and wonders if it might be best for him to move on without them. When she sees his broken heart, Gwen decides to help him win back their affection--and in the process he might just win her heart as well. One of the most romantical book covers ever! And deceptively soothing for the wild ride of action, adventure and the sinister conniving of truly nasty villains you will find within its pages. Nothing like lulling an innocent reader into a false sense of security. :-) Because the opening scene is as tense and dangerous and hair-raising as any Connealy novel. (And disturbingly inventive -- I fear the author must harbor a seriously diabolical mind in order to create so many wonderfully unexpected h One of the most romantical book covers ever! And deceptively soothing for the wild ride of action, adventure and the sinister conniving of truly nasty villains you will find within its pages. Nothing like lulling an innocent reader into a false sense of security. :-) Because the opening scene is as tense and dangerous and hair-raising as any Connealy novel. (And disturbingly inventive -- I fear the author must harbor a seriously diabolical mind in order to create so many wonderfully unexpected heart-stopping opening scenes. ) "It flashed through his thoughts that he'd liked her better when she was unconscious." (p 31) Snort. Love this author's wry sense of humour and the way she delivers one liners in the middle of murder and mayhem -- though I'm in danger of choking when a snort of laughter collides with an astonished gasp. Reader beware. Cam is a bit too used to barking out orders thanks to his army career. Gwen isn't as committed to following through on those orders. Clashing of wills, unexpected attraction, the welfare of two young children to consider and, of course, villains to be thwarted all combine to make their romance a tad on the tricky side. (massive understatement!) And I love fuming over the vile villains and their nefarious plans as nail-biting as that can be. Reading a Connealy masterpiece is tilt-a-whirl of fury, fun and toe-curls and I enjoy every second. I finished listening to this in a little over a day. I think I liked this even better than the first book in the series. Like all of Mary Connealy's books, this is chock full of action and danger. It literally starts with the characters in immediate peril of death. That's just what I'm looking for in a book, lol. The characters were actually fairly toned down for this author's writing style, though they still have a tendency to be impulsive. I expect large, almost unrealistic personalities in t I finished listening to this in a little over a day. I think I liked this even better than the first book in the series. Like all of Mary Connealy's books, this is chock full of action and danger. It literally starts with the characters in immediate peril of death. That's just what I'm looking for in a book, lol. The characters were actually fairly toned down for this author's writing style, though they still have a tendency to be impulsive. I expect large, almost unrealistic personalities in this author's books. That's just how she writes, so it doesn't bother me. I know some people didn't like the first book so much because Trace's approach to Christianity is a little...different after so many years of living by himself. This book is a little more traditional in its approach, fitting with the main character's more traditional view on life. So if you had issues with the first book there, you won't have the same issue with this book. There is some depth to this book, more than the last one, but it's still a Mary Connealy book. It's meant to be a rip-roaring adventure and everything else takes a back seat to that. And this one certainly delivered on the adventure part!!! After reading this book, I can't wait for the third book in the series! "His voice was too loud, his manner too abrupt. He treated everyone like soldiers under his command." Former Union army officer Cameron Scott has a problem; he barks out orders to everyone around him including his family, his friends, and the children he so desperately wants to re-claim as his own. His own daughter is scared of him; she and his orphaned nephew both run to the way-too-lovely-and -stubborn-as-a-mule Gwen Harkness every time he even enters a room. But when a vicious attack confirms "His voice was too loud, his manner too abrupt. He treated everyone like soldiers under his command." Former Union army officer Cameron Scott has a problem; he barks out orders to everyone around him including his family, his friends, and the children he so desperately wants to re-claim as his own. His own daughter is scared of him; she and his orphaned nephew both run to the way-too-lovely-and -stubborn-as-a-mule Gwen Harkness every time he even enters a room. But when a vicious attack confirms that a cold blooded killer is still on the loose, Cam becomes determined to change his ways. Enjoy this fun, flirtatious, family feuding that takes the benefits of moonlight kisses to a whole new level. Union army Cameron Scott is used to being obeyed without question. But, nothing about his journey to Lake Tahoe has gone the way he planned it. He planned only to pick up his daughter and nephew and to get revenge on the ones who murdered his brother and sister-in-law. Instead, he's found himself stranded by blizzards in a cabin with two small children who have no memory of him and are absolutely terrified by him. There's also the stubborn, beautiful Gwen Harkness, who he fears has no intention Union army Cameron Scott is used to being obeyed without question. But, nothing about his journey to Lake Tahoe has gone the way he planned it. He planned only to pick up his daughter and nephew and to get revenge on the ones who murdered his brother and sister-in-law. Instead, he's found himself stranded by blizzards in a cabin with two small children who have no memory of him and are absolutely terrified by him. There's also the stubborn, beautiful Gwen Harkness, who he fears has no intention of releasing his children to him. Things change when danger descends on the cabin everyone is staying in and he's injured in trying to defend everyone. During his recovery time, he's stuck in the cabin, giving him a chance to get to know his daughter and nephew better...and to get to know Gwen better. He quickly finds himself starting to care deeply for her, and believes she feels the same way. It doesn't take him long to see why his children adore Gwen so much and he begins to wonder if it wouldn't be better for their sakes to leave them with her. Seeing Cam's broken heart over the children, Gwen decides to help him relate to and bond with the small children. And, as she helps him win the children's hearts, he also wins hers. I really enjoyed reading this second installment of the High Sierra Sweethearts series. The characters are all relatable and it was good to get a chance to visit with the characters that were introduced in the first book, as well as being introduced to Cameron and his sister. Mary Conneally has definitely done a lot of research into the time period and the area the series is set in and it absolutely shows. She also has a knack for description that comes out in the vivid scenery and in the way the storyline develops. I'm absolutely glad that this isn't the last book in the series because I'm enjoying the setting and the characters so much. I absolutely can't wait until book 3 comes out! I’d like to thank Mary Connealy, Bethany House Publishing, and Netgalley for providing me with an electronic copy of this book in exchange for an honest review. I understand that receiving the book in this manner doesn’t obligate me to leave a positive review and all opinions expressed in this review are entirely my own. Full review on FaithfullyBookish.com The frigid conditions and dangerous circumstances sent a chill to my bones as the adventure continues in this second installment of High Sierra Sweethearts. Winter weather and rugged terrain provided an awe-inspiring backdrop for this exciting, humor-filled romance. Gwen and Cam could nearly qualify as a “beauty and the beast” pairing with her sweet compassion and his gruff thundering persona. Gwen is a natural homemaker, healer, and the kind of person who keep Full review on FaithfullyBookish.com The frigid conditions and dangerous circumstances sent a chill to my bones as the adventure continues in this second installment of High Sierra Sweethearts. Winter weather and rugged terrain provided an awe-inspiring backdrop for this exciting, humor-filled romance. Gwen and Cam could nearly qualify as a “beauty and the beast” pairing with her sweet compassion and his gruff thundering persona. Gwen is a natural homemaker, healer, and the kind of person who keeps things moving in the background. Cam is a former army officer who is having a hard time embracing the “former” bit of his reality. I love that both characters, despite their differences, are willing to learn, grow, and change. This is an entertaining series and I definitely recommend it for readers who enjoy humor and adventurous romance. I received a complimentary copy of this book from the publisher and was under no obligation to post a review. The opinions expressed are my own. I'll have to DNF it for now. There's nothing wrong with the book- I just can't get into it right now. xD I do want to pick it back up in a couple of weeks! Mary Connealy continues her High Sierras Sweethearts series with this second offering and it's so good! Cameron Scott, former Union army officer, is used to barking out orders and having men obey his every word. But now he's come to the High Sierras to take his daughter and nephew home with him and the folks that have been caring for them don't want them to leave. And to make matters worse, both children are scared to death of him. He's been trapped by a blizzard all winter with these folks, cha Mary Connealy continues her High Sierras Sweethearts series with this second offering and it's so good! Cameron Scott, former Union army officer, is used to barking out orders and having men obey his every word. But now he's come to the High Sierras to take his daughter and nephew home with him and the folks that have been caring for them don't want them to leave. And to make matters worse, both children are scared to death of him. He's been trapped by a blizzard all winter with these folks, characters from the previous novel, and one of them, Gwen Harkness, is determined that he is not going to take the children away from her. Then danger arrives at the cabin where they are all huddled to wait out the winter. Cam is injured trying to protect them and now Gwen has to care for him. He's pretty sure she'd just as soon let him die as to save him, too. Then he begins to realize why these children love her so much. But the danger is not going away and they must all stay on high alert if they want to stay alive. Mary Connealy has once again brought her readers a book worthy to be placed on the keeper shelf! I know her books sit on mine. This one really touched me with its spiritual message, too. We don't have to fear when we know Christ as our Savior. She has also left enough intrigue to draw readers back for the third book in the series. I can't wait. *My thanks to Bethany House publishers for a preview copy of this book. The opinions stated here are entirely my own. Title: The Reluctant Warrior (High Sierra Sweethearts #2) Author: Mary Connealy Pages: e-book Year: 2018 Publisher: Bethany My rating is 5 out of 5 stars. Cameron Scott has spent most of his life in the military. Now, that he is a civilian he has a difficult time not ordering people around and expecting their immediate obedience, including his toddler daughter. He hasn’t seen her since her birth as he was serving in the cavalry. His wife died, leaving their daughter with relatives. He has returned to Title: The Reluctant Warrior (High Sierra Sweethearts #2) Author: Mary Connealy Pages: e-book Year: 2018 Publisher: Bethany My rating is 5 out of 5 stars. Cameron Scott has spent most of his life in the military. Now, that he is a civilian he has a difficult time not ordering people around and expecting their immediate obedience, including his toddler daughter. He hasn’t seen her since her birth as he was serving in the cavalry. His wife died, leaving their daughter with relatives. He has returned to collect his daughter and settle on a ranch. However, he is trapped in the mountains near Lake Tahoe due to a blizzard and must remain there all winter. His daughter is afraid of his gruff manner and cries when he comes near. She has developed a love, however, for Gwen Harkness and views her as her mother. Gwen loves Maddie Sue and her little cousin Ronnie, whose parents were murdered while traveling west. She has been raising them for several months, waiting on Cameron to arrive. During that time, she has become more and more protective of them and really doesn’t want Cameron to take them away. She and Cameron are at loggerheads just about every moment and can agree to disagree about everything. Gwen finally realizes that she can’t keep children who aren’t hers no matter how much she loves them. She sees the hurt in Cameron’s eyes when the children cry as he nears. Gwen decides she will help Cameron win over the children. She gives him advice that he actually listens to and begins to slowly find common ground with the children. Before too much time has passed, there is an incident that almost costs them their lives. The discover someone is out to kill Gwen’s sister Deb and her husband. Gwen lives with them. Cameron and the other men set out to track the killer more than once, but he keeps getting away. What will happen for Cameron and Gwen when the snow thaws? Will they ever catch the killer? I absolutely enjoyed this story from beginning to end! The sassy Gwen isn’t afraid to tell grouchy Cameron what his problems are and how to fix them. Cameron while gruff is a fine protector and does indeed love his daughter and nephew and wants them to love him in return. Gwen realizes she has not been acting Christlike toward Cameron at a nudge from the Holy Spirit and softens her approach toward him. I look forward to the third book coming out soon. This is a great historical western! this was a one day--couple hour--read for me. It moves quick, and because it picks up where book #1 left off, there isn't a lot of backstory (if any) needed. This book as expected follows Gwen and Cameron and how they work together to help Cameron "know" his own daughter and nephew. The setting is in the same place as book #1. In fact, if you don't read book #1, you will definitely have issues with book #2. I must say, at least that weird awkwardness that the previous couple (Trace and Deb) had i this was a one day--couple hour--read for me. It moves quick, and because it picks up where book #1 left off, there isn't a lot of backstory (if any) needed. This book as expected follows Gwen and Cameron and how they work together to help Cameron "know" his own daughter and nephew. The setting is in the same place as book #1. In fact, if you don't read book #1, you will definitely have issues with book #2. I must say, at least that weird awkwardness that the previous couple (Trace and Deb) had isn't in this book. This was definitely just a light easy read. Nothing really deep to think about. But since the last book I read was a brain buster, I appreciated it. This far, I am not a huge fan of this series. I like the author's previous series much better. But it's not bad. I gave it 4 stars just because it was good, but not great. Definitely a solid 4 stars. We are introduced to a new set of "villains" in this novel about mid-way, showing me how the next book will set up. We are also clearly shown that book #3 will be following a new man (John McCall) and Cameron's sister, Penny. I'm also curious to see how the weird tattoos Raddo has plays out in book #3, as I'm thinking I know that they are his "insurance" he was talking about. I also imagine his brother Luther will be a figure in book #3. Maybe even pairing up with the new "villain" couple. I will keep reading the series, because it's just a fun western read. This book picks up shortly after the first book leaves off--a couple months later, but everyone is still solidly snowed in for the winter, and the situation from the end of book one hasn't really changed. Thus I highly recommend starting with book 1, as they are quite interconnected. Some days one just needs a lighthearted story where the good guys are good (though definitely not perfect), the bad guys are bad (and through some soul-searching, this villain determines that yes, he just really like This book picks up shortly after the first book leaves off--a couple months later, but everyone is still solidly snowed in for the winter, and the situation from the end of book one hasn't really changed. Thus I highly recommend starting with book 1, as they are quite interconnected. Some days one just needs a lighthearted story where the good guys are good (though definitely not perfect), the bad guys are bad (and through some soul-searching, this villain determines that yes, he just really likes being bad [I rather liked that about him]), and there's just enough romance to sweeten the story. I rather liked Cameron and wanted to defend him, even when he wasn't right. He might be a bossy grouch, but there's no denying his love and heartbreak for his children, and that absolutely tilted the scales in his favor. I can understand Gwen's reluctance to give them to him; he really has no concept of how to deal with kids. But as they begin to work together to connect him and the kids, there are some really sweet moments. This book clearly sets up the next, and I look forward to Penny and John's story! It was fun getting to know them a bit in this book, and should be even more fun seeing what trouble they get into! Thank you Bethany House and NetGalley for the complimentary e-book. I was not required to write a positive review, and all opinions are my own. Mary Connealy returns with her unique and thoroughly enjoyable cowboy historicals with plenty of humor and even more heart in The Reluctant Warrior (Book 2 in the High Sierra Sweethearts series). From the first pages, the action is intense with the group fighting to survive and the interactions between Came and Gwen rocky (and often funny). But those initial impressions turn to something entirely different when Cam gets injured and Gwen is tasked with caring for him. I also loved the interactions Mary Connealy returns with her unique and thoroughly enjoyable cowboy historicals with plenty of humor and even more heart in The Reluctant Warrior (Book 2 in the High Sierra Sweethearts series). From the first pages, the action is intense with the group fighting to survive and the interactions between Came and Gwen rocky (and often funny). But those initial impressions turn to something entirely different when Cam gets injured and Gwen is tasked with caring for him. I also loved the interactions with both of these characters with the children. Throughout the book, Connealy’s ability to place the reader in the setting and situation—from the heartwarming to the heart pounding—is first-rate. I look forward to each and every one of this author’s books, and that goes triple for the third and final book in this series since we are left with hints of what’s coming next). Disclosure statement: I receive complimentary books from publishers, publicists, and/or authors, including NetGalley. I am not required to write positive reviews. The opinions I have expressed are my own. I am disclosing this in accordance with the Federal Trade Commission’s 16 CFR, Part 255. Oh, so much better than book 1! And I am back on board the MC train!! Returning with her trademark humor, suspense, and interesting characters, Connealy finally had a firm "hit" with me after a bit of a dry spell. Lately her humor and characters have just been...lacking. BUT! Cam and Gwen were exactly what I had hoped they would be, and I am SO excited about Penny's story in the next one. Maybe more detailed RTC. I'm just so relieved right now. It had been quite a while since I read book one in the series and I had to work a little bit to remember who all of these characters were. But, I did enjoy this story and I did start to remember what had happened in the first story. I'm looking forward to book three in the series. I was glad to find this book on Kindle Unlimited. I will say I preferred this one over the first, but it still wasn’t my favorite. I haven’t gotten the normal “Connealy” wit and chemistry in this series. It is a super fast read and it’s cute, but not amazing. I’m looking forward to the book 3, though I can already tell I’m going to get annoyed with the bad guys. Lol 3/5 stars. First, of all, I love this cover. Just look at that scenery! I think I'm appreciating the snow covered mountains on the cover and in the story more right now than usual because while other parts of the country seem to be cooling a little, Florida is seeming to get even hotter and muggier than usual. This book picks up soon after the first book in the series, The Accidental Guardian, leaves off. Since that book left me hanging, I was delighted to continue the story. And I loved it! The characters First, of all, I love this cover. Just look at that scenery! I think I'm appreciating the snow covered mountains on the cover and in the story more right now than usual because while other parts of the country seem to be cooling a little, Florida is seeming to get even hotter and muggier than usual. This book picks up soon after the first book in the series, The Accidental Guardian, leaves off. Since that book left me hanging, I was delighted to continue the story. And I loved it! The characters were fascinating. Gwen was so sweet and gentle, yet she also had determination and courage and kept a good attitude through everything. She is a character who I would love to meet if she were a real person. I must be honest, that Cam annoyed me at first. He was too militaristic and demanding However, as the story progressed, I learned the reasons why he acted the way he did. And I was happy to see him grow and learn that while being a leader can be a good thing, leading gently is usually better than demanding control. The characters were just one of the reasons why I enjoyed this book and one of the reasons I think you would enjoy this book. Especially, if you need a snowy setting to take your mind off the heat! I recommend this book to anyone who enjoys historical fiction set in the west, humorous stories, or romance. I received a complimentary copy of this book from Bethany House through NetGalley. Opinions expressed in this review are completely my own. Mary's books are one's you just can't put down. This book is no exception. The Reluctant Warrior – Mary Connealy (4.5 Stars) Following the events of The Accidental Guardian, Army officer Cameron Scott and his sister, Penny, arrive at Trace Riley’s ranch in search of his young daughter and nephew. As a winter blizzard hits the ranch, they find themselves trapped without a means to return home until spring arrives. Unfortunately, an enemy of Trace and his wife manages to find the family and threatens their survival on numerous occassions. When Cam becomes injured protecti The Reluctant Warrior – Mary Connealy (4.5 Stars) Following the events of The Accidental Guardian, Army officer Cameron Scott and his sister, Penny, arrive at Trace Riley’s ranch in search of his young daughter and nephew. As a winter blizzard hits the ranch, they find themselves trapped without a means to return home until spring arrives. Unfortunately, an enemy of Trace and his wife manages to find the family and threatens their survival on numerous occassions. When Cam becomes injured protecting the group and is forced to stay in the cabin for months on end, he turns to Gwen Harkness to learn how to interact with the children and discard his military gruffness for something more closely resembling a family man. With spring’s arrival, Cam must decide between returning to his homestead alone or taking a chance on winning Gwen over to become the children's mother. Ms. Connealy expertly manages to develop an entire novel around a situation that would sound like a glorified case of cabin fever in the hands of a less experienced writer. The Reluctant Warrior builds on the events and characters introduced in The Accidental Guardian, while encapsulating a story all of its own. Overall, I quite enjoyed The Reluctant Warrior. Personally, I thought that The Accidental Guardian had a more gripping storyline, but this novel further develops the full set of characters introduced in the first book of the series. I was surprised that Ms. Connealy was able to do so much with her characters throughout the book, especially considering that most of them are snowed in during blizzards for much of the novel. The introduction of Pinkerton agent John McCall in this novel and his early interactions with Penny Scott promise great things for the events of the series third novel, The Unexpected Champion. These spirited characters became an unanticipated highlight of The Reluctant Warrior, so I'm really looking forward to the next book in the series. Special thanks to Bethany House and NetGalley for the complimentary copy of The Reluctant Warrior! Opinions expressed in this review are completely my own. Thanks! Brittany at the Books and Biscuits Blog PS. To see the full review, please visit http://booksandbiscuits.com/blog/2018.... Thanks! The High Sierras may be beautiful but they are unforgiving. That is the backdrop for The Reluctant Warrior by Mary Connealy. This is the second book in the High Sierra Sweethearts series. Cam Scott has been in war for so long he doesn't know any other way of life. He has found his daughter and nephew, but they don't know him or trust him. They prefer the company of Gwen. Gwen decides that it is heartless to keep children who aren't hers, no matter if she feels that they are. Gwen puts her differ The High Sierras may be beautiful but they are unforgiving. That is the backdrop for The Reluctant Warrior by Mary Connealy. This is the second book in the High Sierra Sweethearts series. Cam Scott has been in war for so long he doesn't know any other way of life. He has found his daughter and nephew, but they don't know him or trust him. They prefer the company of Gwen. Gwen decides that it is heartless to keep children who aren't hers, no matter if she feels that they are. Gwen puts her differences aside to help Cam find his nurturing side. However, the man responsible for killing his family is stalking them and they are in danger at every moment. They will have to learn to trust each other in order to survive this evil man and the unforgiving winter of the High Sierras. This is such a sweet series. I did have the chance to read the first book in the series and enjoyed it. I love how it picked up where it left off and closed that chapter of the story. However, it did keep a couple of aspects of the story open for the next book in the series. Which I am crossing my fingers and toes that it is about Penny. Penny is a supporting character, being the sister of Cam, but to me, she is the most fascinating and the most fierce. I enjoyed her character immensely and she stood out the most for me. Cam and Gwen are wonderful characters as well. They both have amazing development throughout the story. There are a few moments that were a little slow. For instance, the villain's point of view. I felt his point of view offered nothing to the development of the story and his parts tended to slow down the pace of the novel. I must say, the parts of the family surviving, overcoming danger, and learning to live together were written beautifully. The author weaves a little wit in the writing which is a wonderful addition. Needless to say, I am very much looking forward to the next book in the series...in fact, I may have just requested it. Stay tuned for that review! I rate this book 4 out of 5 stars. Thank you Bethany House for a chance to read this book! Adventure in the High Sierras The saga of the Sierras continues with all my favorite characters from The Accidental Guardian. Battling not only the blizzard that cocooned the cabin and bunkhouse but also the man who attempted to burn them alive and the woman who turned his children against him, Cam realizes that he needs to change and he can’t do it by himself. I liked Cam and thought it was amazing that he loved his daughter enough to be willing to humble himself for her sake. With his gruff mann Adventure in the High Sierras The saga of the Sierras continues with all my favorite characters from The Accidental Guardian. Battling not only the blizzard that cocooned the cabin and bunkhouse but also the man who attempted to burn them alive and the woman who turned his children against him, Cam realizes that he needs to change and he can’t do it by himself. I liked Cam and thought it was amazing that he loved his daughter enough to be willing to humble himself for her sake. With his gruff manner and the way he barked orders at everyone as he had been accustomed and even expected to do in the army, the children were terrified of him. He had to learn to be gentle and Gwen was the perfect person to teach him. As the children needed to learn to trust Cam, he and Gwen needed to learn to trust in the Lord and in His strength. I loved that the message to not be afraid was not because God will rescue us from any type of harm but that we can trust Him to keep our souls safe no matter what happens and that we have eternal security in Him. A new plot twist surfaces as new antagonists make cameo appearances. It appears they will be playing a much larger role in The Unexpected Champion, (which releases in March and is available for pre-order now), I won’t give you too many details, but suffice it to say that Cam’s sister Penny will get her own story. This series is designed with each book containing information that will be referenced in the following stories. Though the story comes to a satisfying conclusion, there are cliff-hangers to set things up for the next one. This review was originally posted on Among the Reads I was given a free copy of this item. This gift did not influence my opinion or review. The second book in Mary Coonnealy’s High Sierra Sweethearts trilogy finds much of the cast of book one, The Accidental Guardian, snowed in and fighting for their lives. When injuries sideline Cameron Scott, the father and uncle of the two children who survived a wagon train attack along with Gwen and Debra Harkness, Gwen is called on to tend to him and her heart finally begins to soften as she sees the pain his daughter’s rejection causes. And while chafing to be up and in charge of hunting down The second book in Mary Coonnealy’s High Sierra Sweethearts trilogy finds much of the cast of book one, The Accidental Guardian, snowed in and fighting for their lives. When injuries sideline Cameron Scott, the father and uncle of the two children who survived a wagon train attack along with Gwen and Debra Harkness, Gwen is called on to tend to him and her heart finally begins to soften as she sees the pain his daughter’s rejection causes. And while chafing to be up and in charge of hunting down the last of the three men who killed his brother, it is also when he begins to learn how to function as something other than a Union Army officer. While this is a romance, somewhat a blend of the enemies to (married) lovers and marriage of convenience tropes, it is also an adventure. And while I did enjoy the taming of Cam Scott into a gentler version, and the adorable bonding scenes with the children, it was the danger, excitement, and the growing confidence of Gwen as a frontier woman that kept me reading. The Reluctant Warrior is very much an ensemble piece, with Debra, Trace, and Trace’s ranch hands in the thick of all the action, so reading this trilogy in order will definitely enhance the reader’s enjoyment. Cam’s slightly unconventional sister Penny plays a larger role, and her Pinkerton love interest for book three is introduced. I feel like a broken record with Mary Connealy’s books, but it holds true: if you enjoy Western historicals with heroic cowboys, peppery women, romance, action, adventure, and an author who is a dab hand at mixing in faith and humor, I recommend you give her books a try – and the High Sierra Sweethearts trilogy is a fine place to start. I was approved to read an advanced digital galley through NetGalley, then won a finished print copy from the publisher on GoodReads. This review refers to that finished paperback copy. A positive review was not required and all opinions expressed are my own. “If it isn’t outlaws, then it’s wolves or green-broke horses, stampeding cattle or wild, unpredictable weather. Being on guard constantly is just the way of life in the West for those who want to survive.” --Cameron Scott Once again we meet up with the Harkness sisters, Deborah and Gwen; however, Deborah is no longer a Harkness having married the cowboy of her dreams, Trace Riley, in the first novel in the High Sierra Sweethearts series. The story sets us down once again in the Sierra Nevada Moun “If it isn’t outlaws, then it’s wolves or green-broke horses, stampeding cattle or wild, unpredictable weather. Being on guard constantly is just the way of life in the West for those who want to survive.” --Cameron Scott Once again we meet up with the Harkness sisters, Deborah and Gwen; however, Deborah is no longer a Harkness having married the cowboy of her dreams, Trace Riley, in the first novel in the High Sierra Sweethearts series. The story sets us down once again in the Sierra Nevada Mountain area outside Lake Tahoe a few months later in the spring of 1868. Trace, Deb, and Gwen work to do their best for the two young children, Maddie Sue and Ronnie, from the wagon train attack when Cameron Scott, Maddie’s father and Ronnie’s uncle, arrives at the Riley Ranch along with his sister, Penny to claim the kids. Given the difficult situation, Cam and Penny decide to stay awhile to give the children time to get acquainted with them, and they wind up stranded for the winter. And what a winter it becomes! As Cam basically said in the quote above, if it isn’t one thing in the west trying to get you, it is something else. The winter spins into an adventure of its own as a blizzard and their old enemy, Raddo Landauer, show up at the same time. Another unlikely romance peeks from between the pages of this story as well as adventure and action! An enticing story packed with frontier action and filled with themes of family, friendship, faith, and good versus evil. A fine read for lovers of inspirational historical fiction and western fiction! Enjoy book two in the series! I’m impatiently waiting on book three. This ARC copy was received from Bethany House Publishers and Netgalley.com in exchange for an honest review. The above thoughts and opinions are wholly my own. With clever dialogue, heart-warming moments, and enough mystery and intrigue to keep the pages turning, Mary Connealy's latest novel will no doubt please her fans of her cowboy romances! Those readers who enjoyed the first book of the High Sierra Sweethearts series will enjoy reconnecting with the characters from that first novel, with a greater focus on the brave but soft-hearted Gwen and the gruff Cameron Scott who threatens to take away the children that Gwen grew to love in the first book in With clever dialogue, heart-warming moments, and enough mystery and intrigue to keep the pages turning, Mary Connealy's latest novel will no doubt please her fans of her cowboy romances! Those readers who enjoyed the first book of the High Sierra Sweethearts series will enjoy reconnecting with the characters from that first novel, with a greater focus on the brave but soft-hearted Gwen and the gruff Cameron Scott who threatens to take away the children that Gwen grew to love in the first book in the series. "The Reluctant Warrior" opens with a bang and Connealy infuses plenty of drama as things progress as the characters race not only to survive the elements but to find the man who has brought so much death to the wagon train trail. Now that said, there were a couple of slower moments for me and parts of the book that felt a bit predictable, but I really enjoyed watching Cam learn to bond with the children and work to change to become a better man. And the love that grows between Gwen and Cam is natural and filled with moments of humour, which I greatly appreciated because we all know that in reality our relationships are filled with lots of bumbling and laughs along the way! Connealy brings Gwen and Cam's story to a fine resolution in the closing chapters, an ending filled with danger and courageous moments and the hand of God sustaining them through the fear. And Connealy does a nice job at setting up the third and final instalment of the series, which will focus on Cam's sister Penny and a crazy adventure that awaits her! As for "The Reluctant Warrior", I give this novel a solid rating of 4 out of 5 stars. Book has been provided courtesy of Baker Publishing Group and Graf-Martin Communications, Inc.
A copy of this review can be found at Book Ink Reviews. Thank you to NetGalley, Mary Connealy, and Bethany House for this free ARC in exchange for an honest review. All opinions expressed herein are my own. 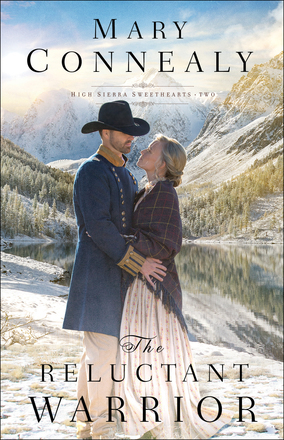 I am so thankful to be able to step back into the High Sierra Sweethearts series. Ironically, I didn't realize this book was connected to The Accidental Guardian until about halfway through when Gwen's thoughts of her childhood sounded so familiar. The Reluctant Warrior is a much longer book. Th A copy of this review can be found at Book Ink Reviews. Thank you to NetGalley, Mary Connealy, and Bethany House for this free ARC in exchange for an honest review. All opinions expressed herein are my own. I am so thankful to be able to step back into the High Sierra Sweethearts series. Ironically, I didn't realize this book was connected to The Accidental Guardian until about halfway through when Gwen's thoughts of her childhood sounded so familiar. The Reluctant Warrior is a much longer book. The romance, while clean, is anything but instant and actually takes a back-back seat to the incredible story of a frontier family fighting Nevada winters and a rabid outlaw bent on destroying all witnesses to his crimes in the last book. It also gave us a great insight into who would play pivotal roles in the next romance. I'm a sucker for historical fiction series that are either generational or stick to the current clan. This was the perfect addition to the series and does not suffer from middle book syndrome. You can read it alone, and you can read the story out of order, but I wouldn't recommend either because you'd miss out on some sweet western romance. The baddie in this book was more impressive than in Guardian. He wasn't as predictable and the few times we were given a glimpse into his POV it was truly chilling. Pick it up! It's the perfect fall and winter read--especially now that my state is already looking at receiving snow.